Training Delivery and Evaluation (often called “Train the Trainer") is an excellent course and certification for anyone who trains others either as part of, or the main focus of their role. Our intensive, 5-day programme aims to give each participant a strong understanding of the skills that effective trainers require. We also include opportunities for practice and feedback from our experienced trainers. This course leads to a QQI Level 6 certification when participants successfully complete and pass the assessment work. What are the Benefits of Running Training Delivery and Evaluation for Your Team? By hosting an in-company training programme, you’ll ensure that anyone who needs to deliver training within or for your organisation has the same level of skill, and a consistent standard of delivery methods. Our trainers have extensive experience delivering both Training Delivery and Evaluation, and other training programmes. They have delivered training in varied environments and situations, and will share their experience and advice with your team. When planning a Training Delivery and Evaluation programme for your organisation, we’ll work with you to ascertain your goals and requirements. We will then custom-alter the course content to focus on giving you the best-possible outcome. This QQI Level 6 Training Delivery and Evaluation certification is recognised and respected as a high standard of training quality. It will enhance your training team’s credibility and boost morale to provide the opportunity for them to achieve this certification. What Progression Options are Available for this Course? 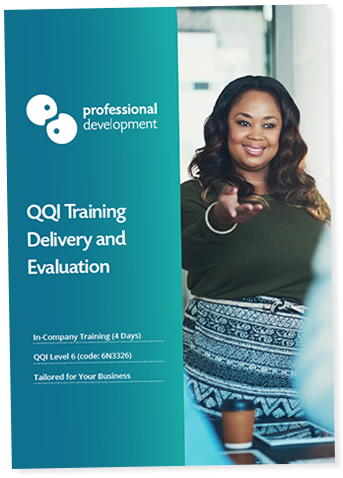 QQI Training Delivery and Evaluation is one of the most popular courses we run, both for public and in-company bookings. It is a must for anyone who wants to deliver effective training, in any environment. Another reason for its popularity is the option to further develop your team’s training portfolio with the QQI Training Needs Identification and Design course and certification. Training Needs Identification and Design focuses on identifying exactly what is required for a training module or programme, and designing content that best-aligns with these requirements. If your team successfully completes both Training Delivery and Evaluation and Training Needs Identification and Design, along with their assessments, they will automatically gain the QQI Special Purpose Award in Training and Development. We recommend working towards this full award for organisations where training is a regular requirement or priority. Why is this course often called “Train The Trainer? When FETAC transitioned to become QQI, the old, very popular course, Train The Trainer was deactivated. To delve more deeply into a full range of training skills, QQI replaced Train The Trainer with Training Delivery and Evaluation and Training Needs Identification and Design. What is the QQI course code? The QQI course code for Training Delivery and Evaluation is 6N3326. The Special Purpose Award in Training and Development is 6S3372. The old FETAC Train The Trainer code is E30179. How does in-company training work? In-company training means that we deliver training to your team at a date and venue chosen by you. It means that we can focus the course content on your business goals. Can I choose to run this as an uncertified course? Most of our clients opt for a certified version of Training Delivery and Evaluation, but it is possible to offer this as a fully practical, uncertified workshop. I’m not looking for in-company training. Can I attend this course as an individual? Yes, we run Training Delivery and Evaluation as a public course, with dates available in Dublin every month. Click here to learn more about our public course, and get upcoming dates.